How To Secure Your Google Account After a Possible Hack? So you have a feeling that your Google Account might be hacked? Maybe you felt some suspicious activity going on, or perhaps you lost your Android smartphone, and you're afraid the thief might have snitched your account before getting rid of the evidence. Incidents like these are quite frequent, and put the victims at a potential risk of identity theft, which often leads to some sort of criminal activity. So it always pays to take the necessary precautions in order to secure your account and avoid potential identity theft. Here's how to make sure your account is safe if you think it might be compromised. Google makes it quite easy for you to keep your account protected, and recover it in case of a possible hack. You just have to know the right options to turn on in order to secure your account. OK, so the first thing you should do is - the most obvious of all things obvious - change your password. Duh, right? I know you might have done that already, but what article about securing your account doesn't tell you to change your password? :). But do make sure that you're on google.com when you change your password. Preferably do it on your desktop PC, and avoid using mobile devices. Ehm, OK. Moving along. Of course, there isn't any suspicious activity on my account right now. But in case of a suspicious activity, you might see a similar message that says "Last account activity: 23 minutes ago. Open in 1 other location”. To investigate this "1 other location" click on Details. You can see a list of countries and IP addresses you've logged on from. You know your account has been compromised when you see any activity you do not recognize. Sometimes, people will listen on your emails for valuable information. If they've been in your account even once, it isn't difficult to set up forwarding, so that valuable emails are forwarded to another email address without your knowledge. To check for any forwarding rules, simply go to settings by clicking on the cog icon on the top-right, and click on the filters tab. Personally, I’m a big fan of two-step authentication. You can learn how to turn it on using this Google Help Center link. All you need to do is, verify a phone number associated with your account, and then whenever you want to login, a code will be sent to your phone number. You'll use this code to login. Any hacker who tries logging in will also need your cell phone. Great Tips! 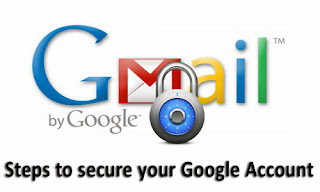 i will use them to get secure my Gmail account. All article is awesome and useful, Thanks for all the great post you did it. very useful info bro Qasim.. Blog security is vital in blogging!! My Google account has been hacked two times, but now from your tips, I think so I can protect my person Google account. Thanks for the great info.